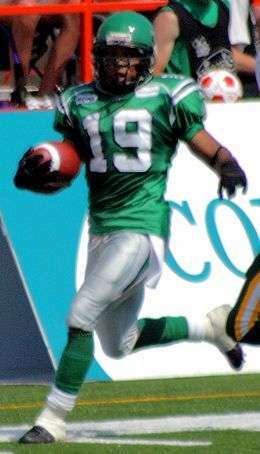 In American or Canadian football, an interception occurs when a forward pass is caught by a player of the opposing team. This leads to an immediate change of possession during the play: the defender who caught the ball immediately attempts to move the ball as far towards the opposing end zone as possible. Following the stoppage of play, if the interceptor retained possession of the ball, his team takes over possession at the spot where he was downed. Interceptions are predominantly made by the secondary or (on some occasions) the linebackers, who are usually closest to the quarterback's intended targets, the wide receivers, running backs, and tight ends. Less frequently, a defensive lineman may get an interception from a tipped ball, a near sack, a shovel pass, or a screen pass, but are more likely to force a fumble than get an interception. As soon as a pass is intercepted, everyone on the defense immediately acts as blockers, helping the person with the interception get as much yardage as possible and perhaps a touchdown (commonly called a "pick six"); at the same time, everyone on the offense becomes the defense and may attempt to tackle the ball-carrier. If the interception occurs on an extra point attempt, rather than an ordinary play from scrimmage, a potential return of the interception to the other end zone is sometimes called a "pick two" as it would be a defensive two point conversion rather than a touchdown. For example, on December 4, 2016, the Kansas City Chiefs strong safety Eric Berry scored the game winning points via a pick two in a 29-28 victory over the Atlanta Falcons. Berry also achieved an ordinary pick six earlier in the same game. On November 21, 2010 Ronde Barber became the only player in NFL history with at least 25 sacks (26 total) and 40 interceptions with a 21–0 win over the San Francisco 49ers. His jersey and gloves from the game were subsequently retired to the Pro Football Hall of Fame in Canton. ↑ Chairusmi, Jim (December 4, 2016). "Chiefs' Eric Berry Collects Pick-Six and Pick-Two". The Wall Street Journal. Retrieved December 4, 2016. ↑ "Brett Favre Career Stats". profootballreference.com. Retrieved 2007-02-08.